Jamie Scholes enjoyed a brilliant week at the Summer British Nationals with City of Peterborough Swimming Club. City of Peterborough Swimming Club (COPS) have completed a brilliant week’s work at the Summer British National Championships in Sheffield. COPS finished with a terific haul of one gold medal, five silver medals and five bronze medals. They finished 40th in the medal table (which has a heavy bias towards gold medals), but their 11 medals in total was a fantastic achievement for a club of their size. Daniel Leigh with his silver medal from the British Summer Nationals. 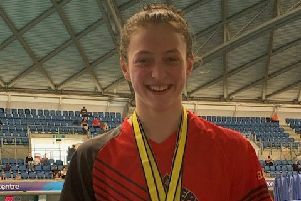 Jamie Scholes (15) had provided the only gold in the 200m backstroke and he added two more medals over the weekend, taking silver in the 100m backstroke and silver in the 1500m freestyle. He’d also previously won a bronze in the 50m backstroke event. Remarkably Scholes completed in the marathon event in between his heats for the 100m backstroke and the following day (August 2) he continued his outstanding form with a bronze medal in the 400m freestyle. Chloe Hannam (19) also claimed a silver in the 400m individual medley and added a bronze in the 400m freestyle the following day (August 2). And there was an exceptional performance from Daniel Leigh (16) who qualified for his 400m freestyle final in 10th place, but led the final from lane nine until the latter stages before settling for a silver. Just missing out a medal was Leah Roughan (16) who was fourth in the 100m breaststroke after qualifying with the third fastest time, She recorded a personal best time of 1.10.65 in the final. Roughan was also part of a 14/16 years 400m medley relay team alongside Rachel Wellings, Katie Brown and Bethany Saunders who broke the Eastern Region record in the heats and the final, but could only finish fourth overall, missing a medal by just half-a-second. Other strong weekend performances were delivered by Poppy Richardson (14) who reached the final of the 400m individual medley and finished eighth, Katie Brown (16) who was sixth in the 400m freestyle and the boys 14/16 400m medley relay team who finished fifth in their final after breaking another Eastern Region record.